CBAP training & certification is perfect for professionals with comprehensive experience in business analysis. CBAP are the credentials awarded by IIBA . This program offers expertise in understanding business necessities and endorsing similar solutions that fetch maximum revenues. 16 hours of Live Training from the Experts. As per IIBA guidelines to get 35 PD's, Individual has to enroll for Live Classroom (VIP Pass). CBAP® (Certified Business Analysis Professional) training & certification is perfect for professionals with comprehensive experience in business analysis. CBAP are the credentials awarded by IIBA® (International Institute of Business Analysis). This program offers expertise in understanding business necessities and endorsing similar solutions that fetch maximum revenues. CBAP offers profound understanding about worldwide acknowledged ideologies of business analysis, in addition to real-world knowledge of business notions that are useful on-the-job. CBAP® certification is treasured by many establishments and are identifying this qualification and seeking individuals with business analysis skill. CBAP® is the most widespread business analysis course globally, and it is affiliated with the 2016 release of CBAP® by IIBA. It will empower you to nurture the skills to be skilful in business analysis, while also qualifying you with IIBA–CBAP® exam at the first go. 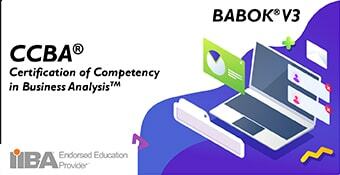 Equipped with this course, you will build proficiency in the six knowledge areas defined in BABOK® Guide Version 3: Those Six areas are - business analysis planning & monitoring, elicitation, requirements management & communication, enterprise analysis, requirements analysis and solution assessment & validation. CBAP® credentials are sought-after ones and they have the potential of high level of acknowledgment at work place along with significant amount of growth professionally and monetarily. CBAP® requires 7500 hours of Business Analysis experience. A CBAP® certified professional becomes an elite member of the business analysis community, and is recognized as an expert who can identify the business requirements of an organization to determine business solutions. CBAP recipients are senior Business Analysts who possess the ability and proficiency to perform business analysis work on projects of different complexities. Many companies are identifying the CBAP designation and the value and expertise these professionals carry to their organizations. Acquire the IIBA membership and apply for the CBAP® exam online on CBAP’s official website, for a total fee of $450. 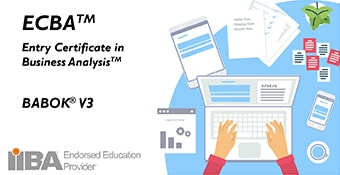 Level 1 – ECBATM: For individuals entering the field of business analysis. The certification provides a prospect to the professionals to get into the leading group of Business Analysts. Apart from receiving professional acknowledgment, the certificate promises career growth and hike in salary. Many organizations have begun to identify the certified CBAP® and are even paying big money for the services rendered by a CBAP® certified professional. Recertification Requires 60 CDUs for recertification after every 3 years. Well presented, detailed information. Exactly what I needed to prepare for, and qualify for, my CBAP exam. The ApnaCourse CBAP course is comprehensive. Good. Track my preparation if possible..
Nicely organised and detailed course. Very educational and easy to use and understand. The course study provided is very useful to get a quick glance of all the knowledge areas in a brief summary. I read the BABOK first and then read the study material. This helped me to revise all the chapters covered in BABOK quickly. Just finished with Elicitation and Collaboration, so far, it has been engaging and fulfilling. Cleared my ECBA examination with ease. Practice tests were useful in clearing my examination. Good material for affordable price, thank you! Business Analyst, BlueFlock Technologies Pvt Ltd. Excellent drive with videos, exam tips are nice, practical examples provide are most appropriate to the situation. Video lectures and live online training is a useful and excellent companion to BABOK. 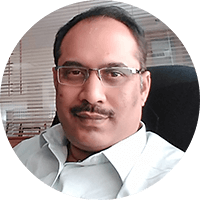 The most impressive part of the course is live online training from Prof. Panduranga. His style of explaining the concept is fantastic. He is always available for any questions via WhatsApp. Thanks, Mr Pandurang. Course content is really good & help full. One can easily clear the exam if follows the session & mock tests. The course is covering BABOK contents well. Excellent for revising and getting quick run through after reading BABOK to improve scores. Very beneficial course for anyone taking the CBAP exam. Highly recommended. A great guide to get my CBAP certitication! Great course. very good content. The course was pretty interesting with detailed overview of BABOK. Good course. Easy to navigate. Good compilation of videos for revision after you have gone through BABOK. Exam questions are particularly useful. Excellent course to meet my 35 Professional Development Hours for IIBA Business Analysis certification. I definitely would recommend this course to anyone aspiring to become a business analyst. This course offers value well beyond its modest cost. While it is sometimes a little challenging for this American to understand the speaker or to discern the meaning of a test question due to language concerns, there's a lot of information here, and I feel prepared to take the CBAP. The course is helping me well in preparing for CBAP exam. Very useful and well-organized courses and materials! Got to know more about business analyst. I am impressed with a teaching as well as the way of course organized. simply superb. Highly recommended course! will get clear idea of what CBAP is..
We have received your request for Personalized 1-1 Training.